Call of The Wild rental cabin located in the north Georgia mountains in Morganton near Blue Ridge. Call of The Wild sleeps 4 and is managed by My Mountain Cabin Rentals. Relax on the screened porch with a cup of coffee in the morning or for cocktails in the evening and enjoy the long range mountain view. Deer and Turkey may be seen feeding in the back yard while red tailed hawks fly overhead! 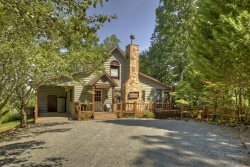 The cabin has a fully equipped kitchen, a stone fireplace, satellite tv, wireless internet, a pool table and air hockey. Come and leave your worries behind. Not Pet Friendly. Everyone answered all questions and were very friendly. It was super easy to book. 100% would recommend to a friend.The property was AMAZING. Had everything and more. The view was so beautiful This cabin exceeded all of our expectations and we will definitely be renting Call of the Wild again.